Yesterland.com: Swan & Dolphin Monorail? The Walt Disney World Monorail system is legendary, and that can lead to urban legends. Here’s the truth behind what is probably the most widely repeated Monorail legend. Monorail route planned for the Walt Disney World Dolphin? 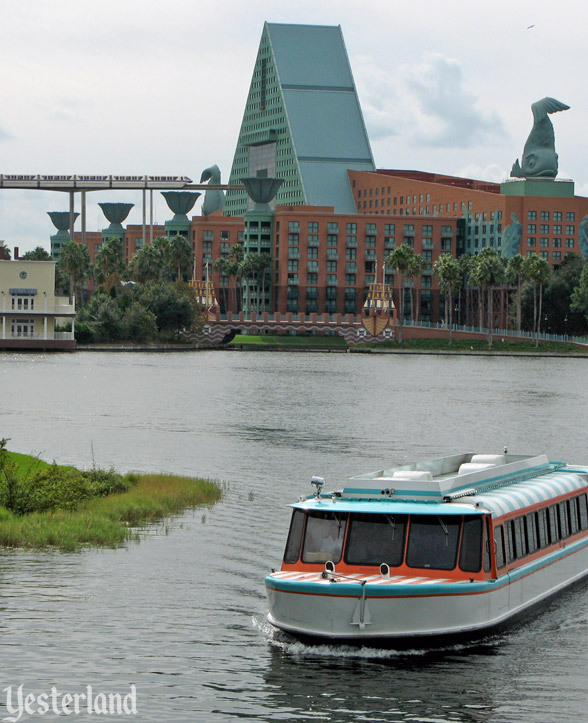 It seems that one or more captains of the Friendship Boats that connect the Epcot resorts with Epcot and Disneys Hollywood Studios have been telling Walt Disney World guests the “interesting fact” that the black areas on the façades of the Swan and Dolphin can be removed to accommodate a Monorail expansion. The story has been repeated on Internet forums and websites. And it’s undoubtedly been repeated to friends, family, and co-workers by Disney guests. There are two versions of the story. One version claims that the spaces behind the black areas are big empty voids. The other version claims that they are filled with “temporary” hotel rooms that can be removed. It’s a good story, but it isn’t true. The black squares are simply design features to make the large façades more interesting. Architect Michael Graves likes to use dark and light areas or different materials to break up building façades. I don’t know if the captains honestly believe the Monorail story, or if they’re just having some fun at the guests’ expense. Around the same time that Michael Graves designed the Swan and Dolphin, he also designed the Aventine in La Jolla, California, named after one of the seven hills of Rome. His 16-story, 400-room Hyatt Regency La Jolla at Aventine has three black squares on its façade. His 11-story office tower at Aventine only has a single black square on it. Theres no Monorail planned for the Aventine either. The black areas on the Swan and Dolphin are substantially different in size (about five stories tall on the Swan, and about nine stories tall on the Dolphin) and in elevation (starting about seven stories up on the Swan, and starting about ten stories up on the Dolphin). They’re much taller than necessary to accommodate the Monorail. If the beam did go through the Swan and Dolphin, there would not be a logical place to put a station. The beam would be way too high, and the buildings aren’t nearly deep enough. So where would the Swan and Dolphin station go? There are no fake rooms behind the black squares. The rooms are quite real. 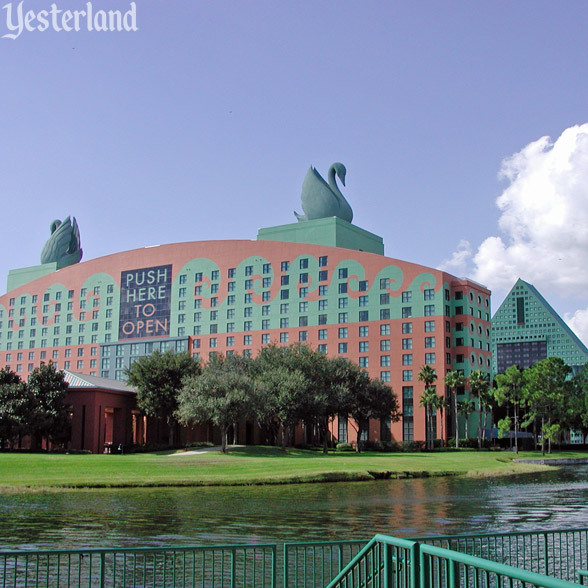 I even stayed in one at the Walt Disney World Swan in October 2012. 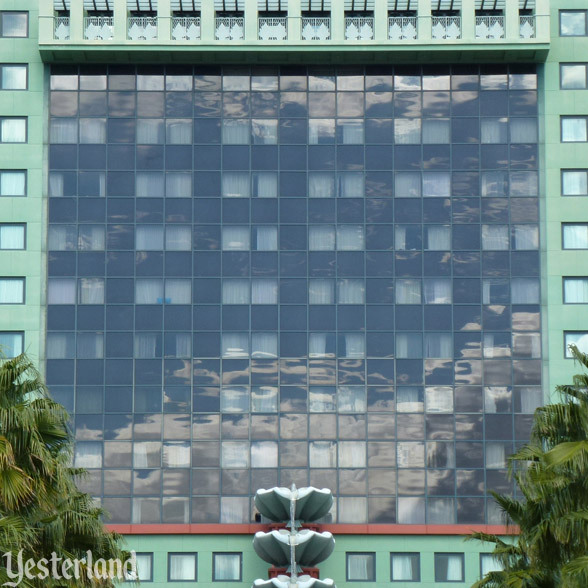 However, the Walt Disney World Dolphin actually does have fake rooms—or, more accurately, rows of fake windows at the top of the triangle. Most of the windows above the black square don’t have rooms or floors behind them. They’re only there for appearance. The next time anyone tries to tell you about fake rooms in the center of the Dolphin, point out that the truth involves looking higher. This is the first of three Monorail stories today. Click Here to continue to the second one. “Photoshopped” image of Walt Disney World Dolphin with Monorail: 2013 by Werner Weiss, based two 2009 photos by Werner Weiss. “Photoshopped” image of Walt Disney World Swan: 2008 by Werner Weiss, based on 2006 photo by Werner Weiss. 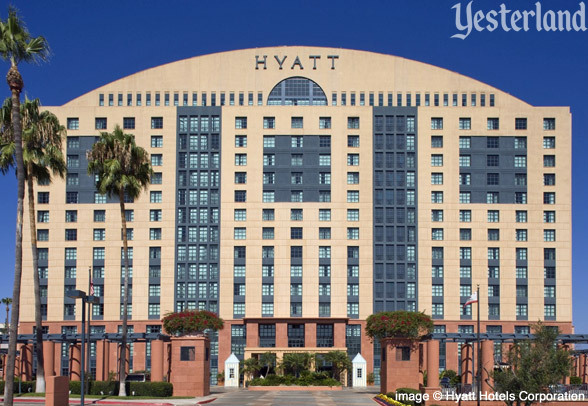 Media photo of Hyatt Regency La Jolla at Aventine © Hyatt Hotels Corporation. 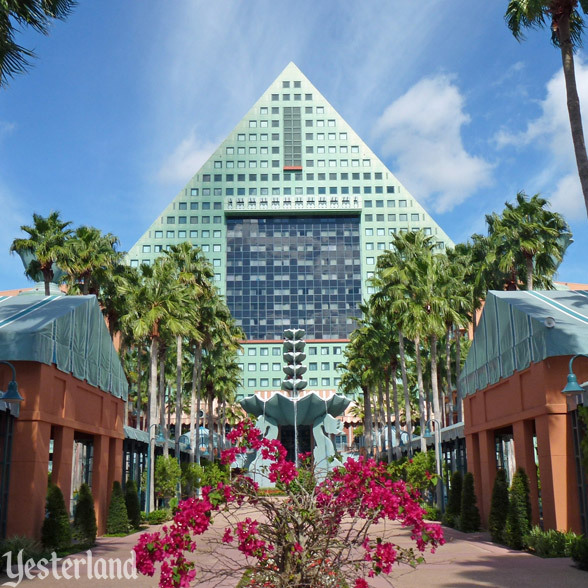 Photo of tringular tower at the WDW Dolphin: Werner Weiss, 2011. Photo of black square on the WDW Dolphin: Werner Weiss, 2011.